No matter how many goals you have, it can be difficult to predict where exactly your company and industry will be in the next five years. Fortunately, IDC Futurescape has made it their job to make predictions on where the IT industry will be in the next five years, which makes it easy for you to use that information and apply it to your own business. We attended the IDC Futurescape webinar where IDC discussed their Worldwide IT Industry 2019 Predictions. They presented ten predictions for the future of IT, the impact those predictions will have on business and IT, and gave recommendations for companies to evolve considering these predictions. From IDC’s extensive research, including the sixty-minute webinar and a 25-page report, we walked away with five key things that businesses need to do today to excel in tomorrow’s IT world. We believe as you change the attitudes, systems, and voice of your company, you will be able to better meet the needs of your customer in this continually evolving industry. Simplus is a go-to consultant in the IT space, and we are confident that we can provide services that will help you achieve success. Emphasize that every employee has developer potential. By 2024 a new class of professional developers will be producing code without custom scripting, accelerating digital transformation. This will put stress on existing policies, which means it is vital that you develop the mindset that everyone is a developer. Consider training current employees as developers, and encourage employees to rethink procedures around data access. Teaching every team member to be a developer will help your company to keep up with the rapid transformation of the digital world. To keep up with the rapidly changing world of technology, you must adopt the Agile or DevOps methods. IDC predicted that in the next five years, 500 million new logical apps will be created. This is the same number of apps that have been built in the last forty years. The availability of public and private code repositories will allow developers to reuse code, dramatically reducing development time. With so much innovation, it is vital that your company adopt an Agile or DevOps method to develop and evolve according to the needs of the consumer—and keep up with the rest of the industry. As AI becomes the new UI, work with your marketing or human resources department to define the voice of your business. IDC predicts that by 2024, AI-enabled user interfaces and process automation will replace one-third of today’s screen-based apps. Intelligent conversational assistants such as Google home, Alexa, and Siri will be increasingly used to replace human tasks. Using AI will help streamline office processes and improve customer service. As you define the voice of your business, be sure to become familiar with intelligent process automation capabilities and develop a plan for how conversational AI can be utilized with your business. Ensure that your AI continues to reflect the voice of your business. 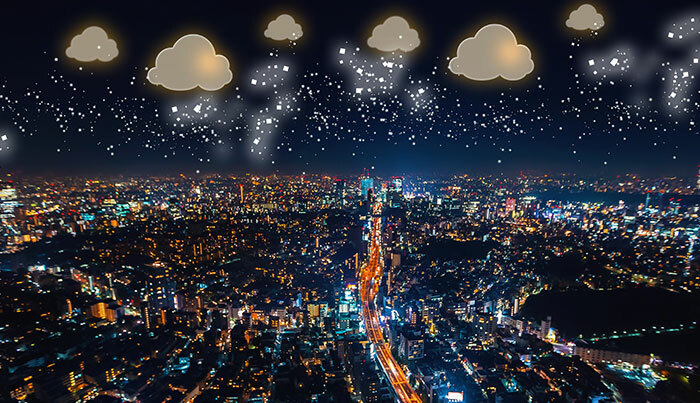 In the next five years, we will see a rapid expansion of the cloud, which means it is vital that you select providers that support a “distributed cloud” vision. Using a distributed cloud means that you’ll be able to share information among multiple systems and access it from different locations. A distributed cloud will provide an advantage in the competition to be at the edge. Read this article on Forbes.com from our CEO, Ryan Westwood, to learn three ways cloud solutions can benefit your workplace. In the next few years, businesses with customer-proximate facilities will lead distributed cloud deployment. Selecting a provider that supports a distributed cloud vision and provides tools that optimize complex edge IT will give you the ability and advantage to compete well. According to IDC Futurescape, in about five years “75% of all IT spending will be on 3rd platform technologies,” meaning it’s important to consider which cloud mega platform you select carefully. Multi-cloud management strategy will help you to optimize resource utilization. Select a cloud mega platform provider that will help you to create an integrated hybrid/multi-cloud management strategy. Look for companies that leverage open technologies and protocols and that use AI-enabled automation. Cloud and AI technology will become more and more prevalent, and it is important that you choose a cloud provider that will help your company to keep up with the rapidly evolving world. Simplus is proud to be a third-party that can provide you with all of the technology and services necessary to not only keep up with but also get ahead of your competitors. We are proud partners with Salesforce and know that platform is the ultimate place for you to build customer journeys, use AI to limit time-consuming tasks, and maintain beneficial relationships with your customers and partners.